Konnector is a scalable de novo assembler for paired-end reads. 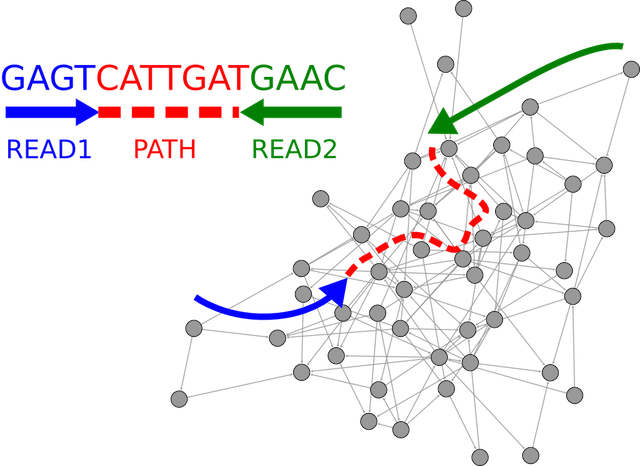 It fills in the nucleotides of the sequence gap between read pairs by navigating a de Bruijn graph (DBG) represented by a Bloom filter. The Bloom filter is a probabilistic and memory-efficient data structure that enables storing the de Bruijn graph using a mean 1.5 bytes of memory per k-mer (our implementation), which represents a marked improvement over the typical hash table data structure employed by most DBG assemblers. The memory usage per k-mer is independent of the k-mer length, enabling application of the tool to large genomes. The release of Konnector 2.0 introduces the ability to extend paired-end sequences outwards in the de Bruijn graph, in addition to merging reads pairs via connecting paths.